Sorry for the big hiatus! Busy busy time at the moment. The guy above looks suitably unimpressed about getting his picture taken. It was PC gone mad when they took The Black and Green Minstrel Show off the air. Panther Science Fiction, you never disappoint! His mum warned him: eat too many packets of Pacers you’ll end up looking like one. The full body photo is probably to awesome for the human mind to comprehend. 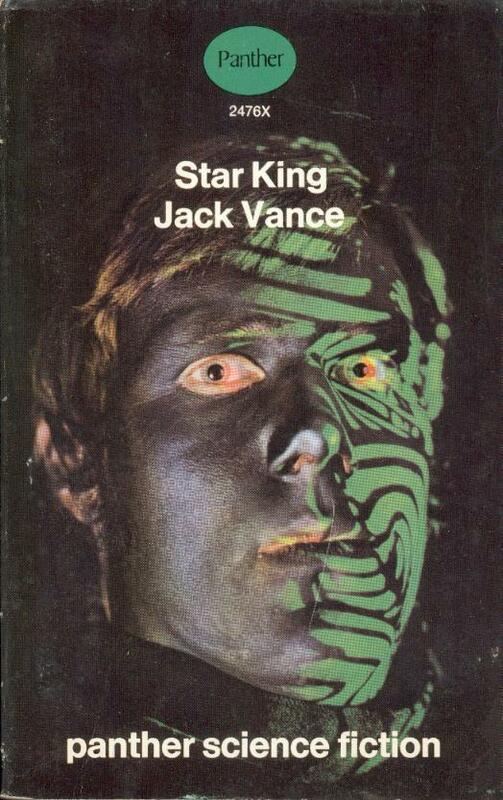 Is this “Star King” by Jack Vance or “Jack Vance” by Star King? On every Paintball Friday, he always got carried away with the camouflage. After working on the computer all day next to broken Venetian blinds, Paul’s creative mind came up with a way to prevent skin burn. Hey there, Maze Face! How’s it going? All keepers of the labyrinth must have the maze branded on their face. It is often speculated that this rule came about because the first keeper was an extremely strange person, and definitely crazy. This is what can happen to your face if you accidentally walk into the title sequence of a 1970s DR WHO episode. “Star King Jack Vance” beats “Max Power” by a mile. I have decided I want to be referred to as ‘Star King Tom Noir’ going forward. Thank you. Give the size of his pupils, he probably wasn’t too aware of what the photographer was up to when they called him in for the shoot. It wasn’t until he had already broken in and entered the apartment that the burglar realized the second tube of black camouflage he opened when the first one ran out might have been not black but, in fact, glow-in-the-dark green. Looks like Mark Hammil from Return of the Jedi 2. Sadly, the movie went straight to Beta. Love this one. It’s got a claustrophobic space interrogation vibe to it. It’s that starking jack vance again. I thought “starking” was British for “streaking”. From “starkers”. Why anyone thought a picture of a guy in badly-applied blackface with glowy green fingerprint patterns on one side of his face was a good idea to begin with, let alone to put on the cover of a book is beyond me, but that’s why I’m here at GSS instead of making the big bucks in the exciting world of terrible book covers. Streaking is called streaking in Britain too – Ray Stevens’ comedy (?) hit record was successful here and you had hairy 1970s blokes jumping over the cricket stumps at Lords wearing nothing but a smile. And the sainted Erica Roe tried it at the rugby, of course. “Starkers” is an abbreviation of “stark naked”.